Just a quick note and another card. I'm off to meet with my LSS owner to discuss classes and hopefully SHOP a bit for some gifts after that. 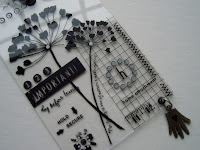 3 stamps, a little bit of gunmetal Stickles and a polka dot paper that I've been dieing to use. A quick touch of black soot distress ink seemed to add just enough contrast. The photo is not the best...sorry...but hopefully you get the idea. The clip, top left, is silver. Like I've said before, my photography skills are equal to that of a first grader. I'd rather stamp than learn camera stuff! Have a wonderful ARTY weekend!! STAMPED CRACK!! Same corner stamp as yesterday, just used with a different color and different base product. 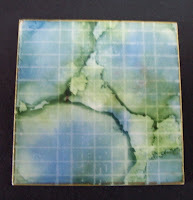 I painted the distress crackle paint on a 4 x 4 cheapo canvas & LOVED how it turned out. Not sure if it's finished yet...but I wanted to share. Here's a close-up of the crack...LOVE it!! MAKE ART! Or...maybe SHOP! That's FUN too!! 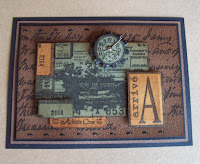 3 stamps, Adirondack Butterscotch over Basic Grey paper for the background, a little embellishing & this is the result. A fun & pretty simple card! Happy Wednesday! Groceries for me...I'd rather buy STAMPS!! makes me soooooooo happy! Vintage...it's the real me!! Hmmm...reminds me of a book by my friend Shari Carroll. Check it out if you haven't seen it. I've been bugging her for the sequel. Haven't seen it yet. But then again, I've been bugging Ginny for another Art Continuum...haven't seen that happen either! HA! Think these 2 friends will take this gentle hint?? Stay tuned..I'm enjoying this "card a day" stuff! Back to my stamps. They listen. 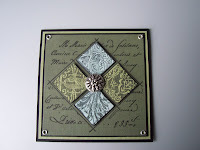 Use the same stamp (U2-719) on 3 co-ordinating cardstock colors. Cut 2 squares from each of the 2 lighter colors. Mount them over the base card with some foam dots to add dimension, add a few cardstock layers under the base & a cool button. Done!! Amazingly...NO vintage photo was used anywhere, but look out!! It's coming! I can't stay away forever! WHAT? ?...a card with NO vintage photo??? Now here's a real surprise. NO vintage photo & I really like it. 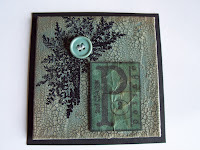 4 different stamps from Stampers Anonymous, a little faded jeans and scattered straw, a bit of zig-zag stitching & we have a card! Fun!! Can you find all 4 stamps?? Mr. FED-EX just delivered this GREAT gift from my friend, Robin Beam. I LOVE it and the colors are PERFECT!!!!!!! It's done with her famous bandanna technique, which can be found on her blog. It's 2 inches by 10 inches and it looks PERFECT right under my Ranger U certificate. Both hang above the sink in my studio, so that every time I wash the ink (vintage photo) off my hands I'll see it. For those of you who know me and know how sloppy I am...this will be about 50 times a day! I'll post a photo when the lighting is better. Here's a close-up of the details. Rick was VERY impressed with the soldering job! I think she will do custom orders. If you are interested, her contact info is on her blog or you can email me. Mona, a little grunge and a BIG THANK YOU from me! Mona is one of the new stamps I got on Sunday. She didn't stay uninked for long. 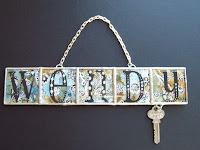 As a little THANK YOU for my faithful blog readers...I'll show you how easy this was to create. If you have taken classes from me, I hope you remember me saying NOT to only look @ the stamps for their obvious image, but look @ them for what they COULD be. This justifies the purchase, when you have multiple uses for them, or so I tell Rick! If you notice, the arrow I chose was a little big, so I cut it down to fit. OK...start with these stamps from Stampers Anonymous. Mona is new, but the others have been used many times before. ALWAYS add dimension to my art, because I find a completely flat project to be boring. I'm not sure if you can see that the "5" is raised the highest and the arrow is raised, but a little less. 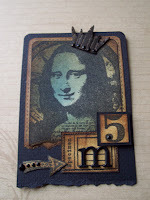 I also machine stitched around the "specimen" label, to add another layer of interest and pen stitched around Mona. And the finishing touch...just what Mona needed...a grungeboard crown. I originally inked it with vintage photo, I'm sooooo predictable...but it didn't stand out enough, so I added some black soot Distress Embossing powder. I LOVE this embossing powder, because there is no shine. It's the PERFECT product for those who like the shabby vintage look. I added just a few jewels to complete the project. SIMPLE. Have a great holiday and THANKS for visiting my blog! I am THANKFUL for each & EVERY comment! Now this is VERY COOL!! My friend Linda sent me a link this morning. 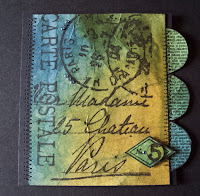 What a nice surprise..I have my Distress Ink tutorial on Suze's site. Check it out here!! Just click on the Maya Road DT link... You'll find lots of great info on her site. And in other breaking developments...ALL those Stampers Anonymous stamps are now resting comfortably in their new homes. It took me all day yesterday to get them JUST RIGHT! The above photo shows the BORDER drawer. To answer the emails about how I store my stamps...Because I LOVE light & have skylights and lots of windows in my studio, all my stamps are stored in drawers like this. Direct sun is the one thing that is NOT good for rubber. My center island is 4 foot by 5 foot and it is all pull outs filled with stamps. 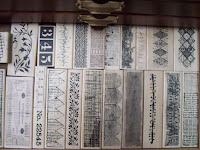 This photo is one drawer of the first stamp cabinet that I bought. I remember bringing it home ( about 5 years ago?) & telling Rick that this much storage would last me forever. 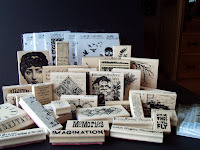 Before that, ALL my stamps and supplies were in one shoebox! Little did I know that I'd become ADDICTED to rubber! And to answer the next question...if they are in drawers...how do I know what I have??? Believe me, I know them all. Touch one or move one & I'll KNOW IT! Only one time did I purchase a stamp that I already had. I am dieing to get them ALL inky, but groceries call. Yes, there IS a HEAVEN!!! and I'm sure it's made of rubber! 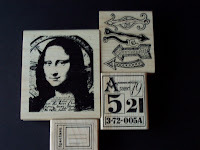 Yesterday, we drove to Madison Wisconsin to a stamp convention, specifically to visit the Stampers Anonymous booth. 5 hours in the car was definitely worth it to get these awesome art stamps. Think you'll be seeing some samples posted here?? OK...now to find the perfect home for these beauties. Organizing them is almost as much fun as creating with them. I LOVE it, probably because the stamps are just so inspiring. This is a MUST HAVE..The new Design Ruler by t!m. He thought of everything. It has a metal edge, it's clear, it's a centering ruler & it has perfectly spaced holes for piercing. The other products from t!m, that I got yesterday, are fragments...(I've been dieing to get these) & I scored the grungeboard!! Life is good in Oglesby! Finally...a REAL FULL photo or even 3 !! This is up on our DT BLOG now, so it's safe for me to post the whole photo. This was a sneak peek from a few days ago, if you remember one of the famous CRACK posts. This started out as a plain wooden tote that I initially painted white. I added the yummy Daisy D's paper first & then the fun started. 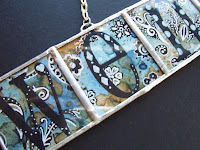 The chipboard letters and snowflake were painted with fired brick Distress Crackle paint. 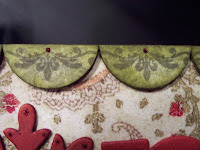 To make the scalloped border, I cut the foundations chipboard circles in half, covered them with paper & stamped each one with our clear acrylic scroll stamp and accented each with a tiny dot of Stickles. If you live in cold weather, you understand the chipboard arrow and the words "SURVIVAL KIT", which are done with Maya Road Noah rub-ons. Winter in Illinois is NOT fun! This photo shows the inside bottom of the tote. The frame is from our chipboard foundations set and is colored with fired brick distress ink. 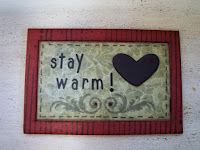 I stamped the scroll again, accented it with Stickles & added the adorable microchip heart and a little pen stitching. These micros are just soooo cute. Filled with some goodies for that special someone, this makes a fun gift! Have a great artful weekend!! EDITED @ 7:45pm...to answer the emails...yes, there are matching chipboard snowflakes on each side & there is one on the back too. Thanks for asking!! Pre-ART... and we have a winner! andi~!~ Congrats to you! Rick thought you sounded NEEDY! HA! Send me your address & I'll get your package in the mail ASAP! Winter has hit Illinois! Time to find a turtleneck & a nice warm sweater. Addicted to crack...and a few random things.. I know..I deserve the BAD BLOGGER award! SORRY, but my excuse is..... I'm addicted to crack. This paint is absolutely foolproof. The bird and branch are from Maya Road. 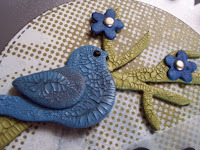 The bird got a dose of faded jeans distress crackle paint & the branch is done with shabby shutters. The background paper is from the Periphery collection, Basic Grey. LOVE IT!! Can't show you the whole project, but take my word for it... SHEER fun! And more rub-on talk...I got a call yesterday from Karan, who owns Magic Mesh. She found my blog & offered this little tip, which amazed me. Rub-ons can be applied OVER Magic Mesh, for a cool effect. I tried it & it's fun. I had no clue that it can also be embossed & painted over. Interesting play. I think it's great for all the sheer products and acrylic products that seem to be so popular these days. The reason...NO adhesive is needed & it looks great on both sides! 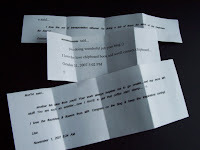 I've heard from all 3 who won prizes on the blog. All of the packages arrived @ their destination. However, I still haven't heard from E. 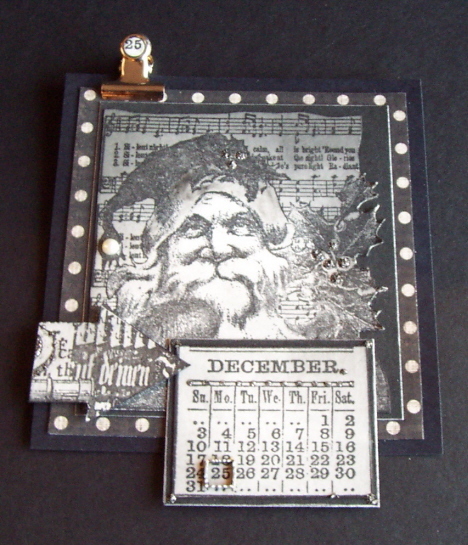 So...I still have this adorable chipboard train album (and a few other trinkets) waiting for a new home. Interested??? Tell me why you NEED it & I'll see if Rick can be talked into another drawing...very soon!!! 1. God did not create all rub-ons equal. Being a rubber stamper, I had very little experience with them, so this was a HARD lesson learned. I won't name the bad ones, maybe they work on paper or maybe they are 100% JUNK......but I did find out that Maya Road, Daisy D's, 7 gypsies , Fontwerks and Basic Grey work very well on acrylic. I have some other well known brands that I've not tried yet...but I will. 2. Some rub-ons just flake off or just fall off the protective paper when you LQQK @ them. That made me upset. 3. Some rub-ons can be removed by wiping them with window cleaner. 5. Acrylic attracts fingerprints. Imagine that! 6. Acrylic projects are not easy to photograph. 7. Some rub-ons are black on both sides and some are not. Sometimes this matters...sometimes not. 8. Words & numbers MUST go on the front of acrylic. 9. 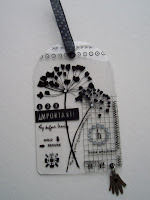 Patterns, flowers, designs and other things can be applied to the back of the acrylic to create dimension. 10. Acrylic is FUN and WAYYYYY different than paper! ps...I'm STILL looking for "e", who posted on October 31st @ 6:28pm...I'd like to get the last prize shipped! Please send me your mailing address. THANKS! CSI tonight!! 2 hour episode...Sure hope it's better than last week. She posted this comment & WON..Please send me your address, so I can get your goodies off to you. I love the set of transportation albums! I'm doing a set of them for each of my nephews for Xmas! ps...blogging without a photo is boring. 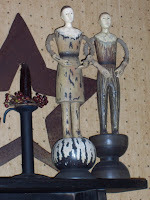 This couple makes me smile! I'll try for a better photo...SOON! "that's about as much fun as waiting for paint to dry"? Well...times have changed. 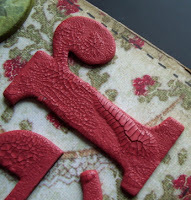 It IS fun to wait for the Distress Crackle Paint to dry. This stuff is AMAZING. Just paint some on some chipboard and wait for the magic to happen. Perfect results every time! The color above is fired brick. 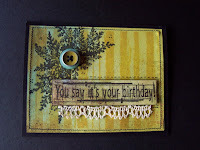 Paper peek is from Daisy D. I LOVE IT! And for those of you who complain about the peeks...SUFFER!! A little photo is better than NO PHOTO! That's my story & I'm stickin' to it! THANKS to ALL who visited the blog & left comments. I really appreciate all the sweet notes & I'll pass the "FAVORITES" info on to Caroline & Deb. You guys are GREAT!! CONGRATS girls!!! Please send me your address & I'll get these in the mail ASAP!! I've really enjoyed this and I WILL do it again. 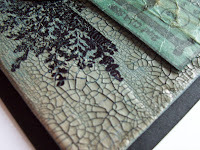 Stay tuned...sneak peek coming, as soon as the Distress crackle paint...cracks!! Ok...more prize info & a GIVEAWAY!!! It's pretty obvious that we all like FREE! This one isn't from me, but from Ginny! 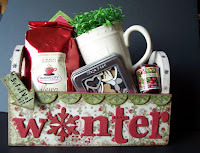 Check out her blog, make a comment to be entered in her drawing & tell her that I sent you. She just might send me an awesome wooden angel, but then again...MAYBE NOT! Scroll down to see it on her blog. You are in for a treat! TONS of eye candy there!! PS......Keep the posts coming here too!! You've got 'til Monday morning to get us up to 150 comments, so Rick can choose LUCKY 3 winners!! t!m...(only one name needed) FINALLY started a blog and I added his link yesterday! Send me your address & I'll get your prize in the mail! THANKS for playing & BE SURE to check out T!M's cool site. If you haven't seen his video demo of grungeboard, you're in for a treat! Tell him I sent you!! ps...check my blog often...I'll do random unannounced giveaways....sometime.